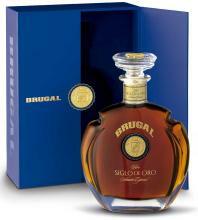 This is the original Brugal Extra Viejo imported directly from Dominican Republic non the Exta Viejo bottled in Europe. The famouse yellow net format. The first diet alcoholic drink, just 55 calories per drink, 50% less of calories. Aged in ex-bourbon american oak barrels and finished in ex-Pedro Ximenez oak barrels.